Fluid Dispensers, Dispensing Supplies, Equipment. Bunt, Stainless Needles, Tapered Tips. • Premium, Precision Fluid Dispensing With Air Power! Yet With Manual Override Option! • No More Manipulating and Squeezing Tubes! • Micro Dotting Capacity! Works with Microscopes. • All Metal, ESD-Safe Construction (Not Thin-Wall Plastic). Sturdy, Industrial Construction! • Widest of Selections of Blunt Stainless Steel Dispensing Needles. Shockingly Low Prices. • Tapered Dispensing Applicator Tips. Shockingly Low Prices. • Large Range of Diameter Openings from 14 Gauge to 30 Gauge. • Helpful Color-Coded Chart with On-Line Ordering. • Click Photo for Detailed info Including Specs & Pricing. • Our Barrels Include the Tip Cap, End Cap & Piston at Shocking Prices! • Finally! 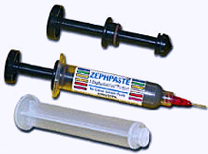 A Solder Paste / Cream Developed for Prototyping & Rework! 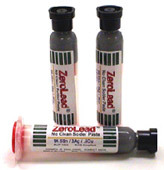 • Every Order Ships Out From Factory "On Ice"
• RoHS Compliant Lead-Free Solder Paste Formulation. • Six Month Shelf Life. Yields Beautiful Satin Finish Solder Joints! • Rubber Skid Resistant -- No Slipping! • Convenient Dispensing Slots: Easy Access!